I like to make these in individual ramekin cups. Reduce cooking time to 25-30 minutes. This is a traditional Mexican and Spanish dessert and by far my favorite. It is very easy to make and looks beautiful. Heat 1/2 cup sugar in a heavy skillet or saucepan, stirring constantly until it melts and turns a dark golden color. Remove from heat and immediately pour into a 4 1/2 cup metal ring mold, swish it around so it evenly coats the bottom of the ring mold. In a large mixing bowl, lightly beat the eggs. Stir in milk,1/2 cup sugar, vanilla and orange peel. Place caramel coated ring mold in another pan and place on an oven rack. Pour egg mixture into the ring mold and pour the hottest tap water possible around the ring mold to a depth of 1 inch. Bake at 325F for 50-60 minutes or until a knife comes out clean. Cool flan on a wire rack, Chill for at least 3 1/2 hours. 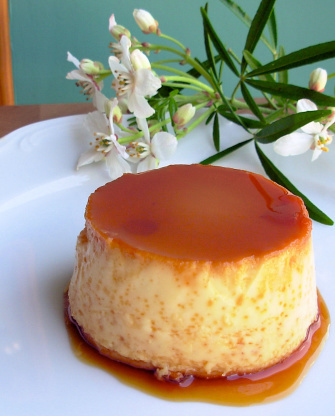 To unmold the flan loosen edges with a spatula, slip spatula down the sides to let air in. Place the serving platter over the mold and flip to allow the flan to slip onto the platter. Spoon the caramel that may remain in the mold on top of the flan. Pile sliced fruit in the center and serve.